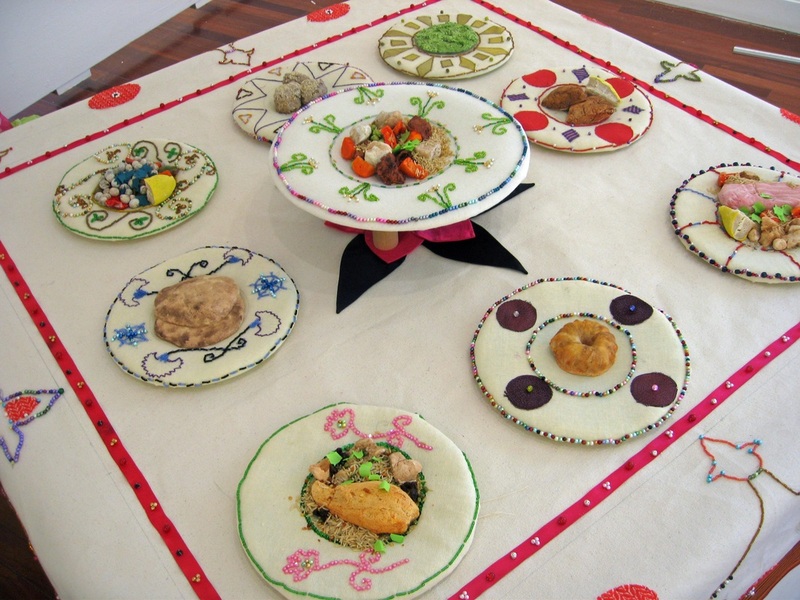 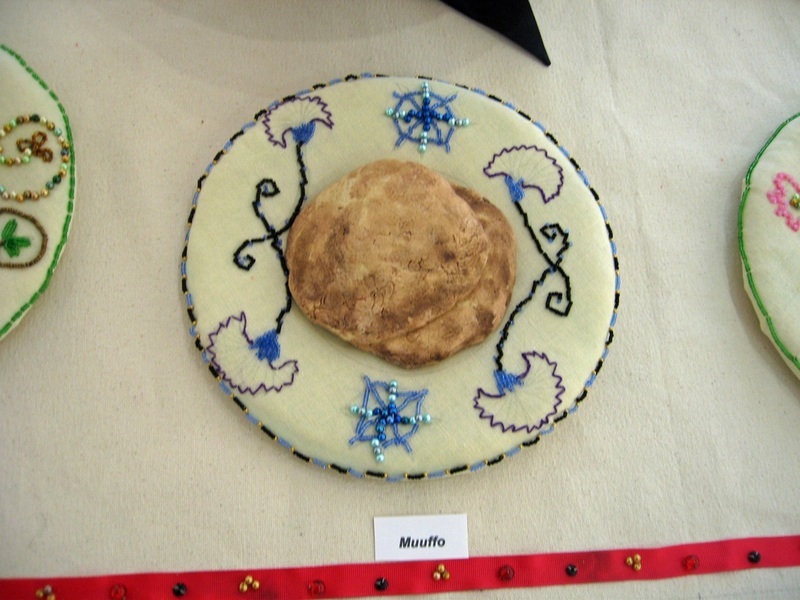 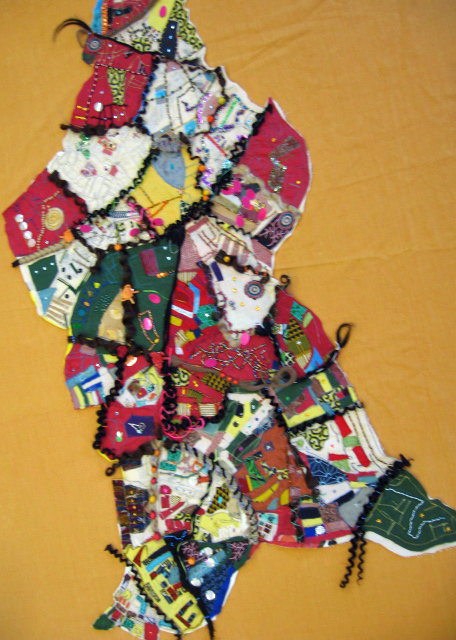 Fion was awarded a grant from Arts Council England for 'The Dress My Mother Wore' she was lead artist on this collaborative art project with Streatham Women's Sewing Group CIC. The artwork was installed at public festivals and events throughout London, 25 women participated in the making of the artwork and over 1300 people participated in the associated public workshops. 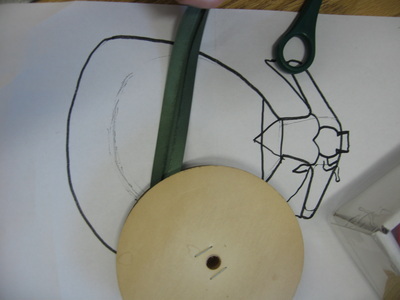 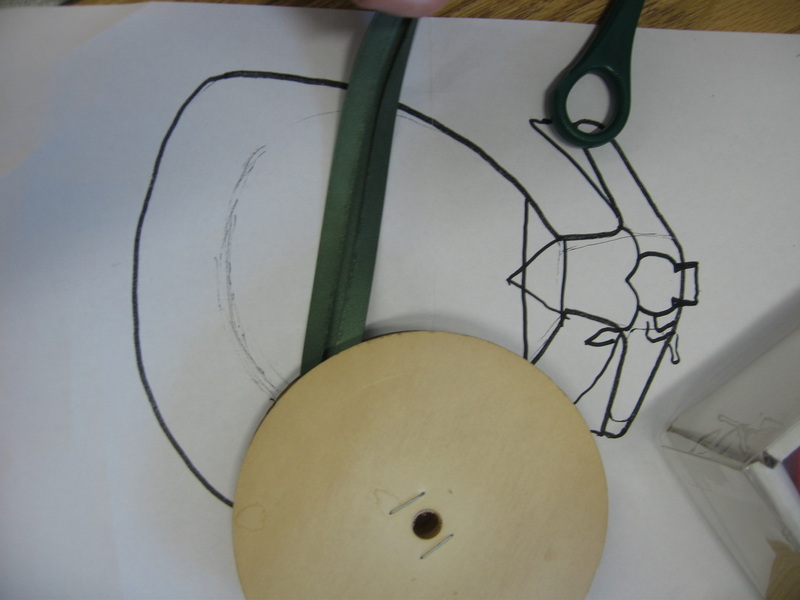 In 2009 Fion founded Streatham Women’s Sewing Group CIC with local Somali Craftswoman Ifrah Odawa in response to grassroots & Council demand for a project which engaged with the Somali Community in particular & other hard to reach communities in Streatham. 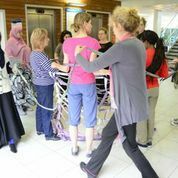 Over the many years of war, famine and immigration many younger Somali women who have lost their mothers or been separated from them have not been able to learn these skills. 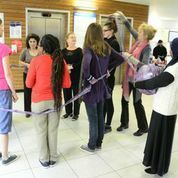 Since its inception ithe Group also reached out to women from minority and low-income backgrounds and other hard to reach groups: refugees & victims of domestic violence. 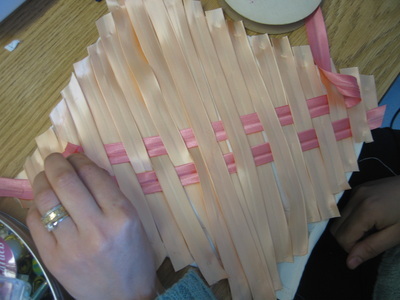 On average between 10-15 women attended each weekly session and a total of over 150 women attended the Group sessions and learned how to sew..
Fion was the lead artist/ manager/administrator and Chair of the Board of Directors. 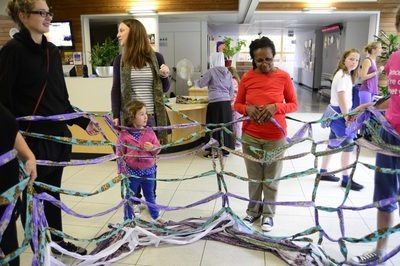 Producing collaborative artworks using the newly learned skills of the women is crucial in raising the profile of these hard to reach communities in a positive way with the wider community. 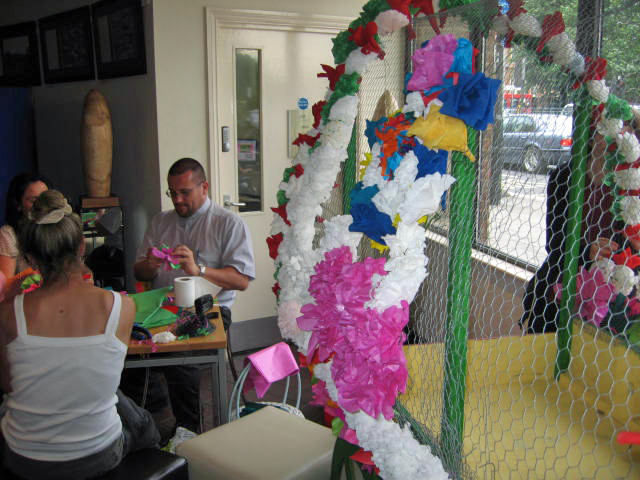 This was a means of interesting the non-Somali, non-refugee public in fundamental aspects of Somali & other Asian & African cultures – arts and craftwork with which the wider community could engage. Artistic collaboration was at the heart of the Sewing Group's projects and the aim was to encourage artists from within the Somali community and other African and refugee communities to be involved in the events. Ifrah Odawa (Coordinator & Member of the Board) who is a member of the Somali community in Streatham was particularly concerned to help women regain the skills which were traditional in their communities. 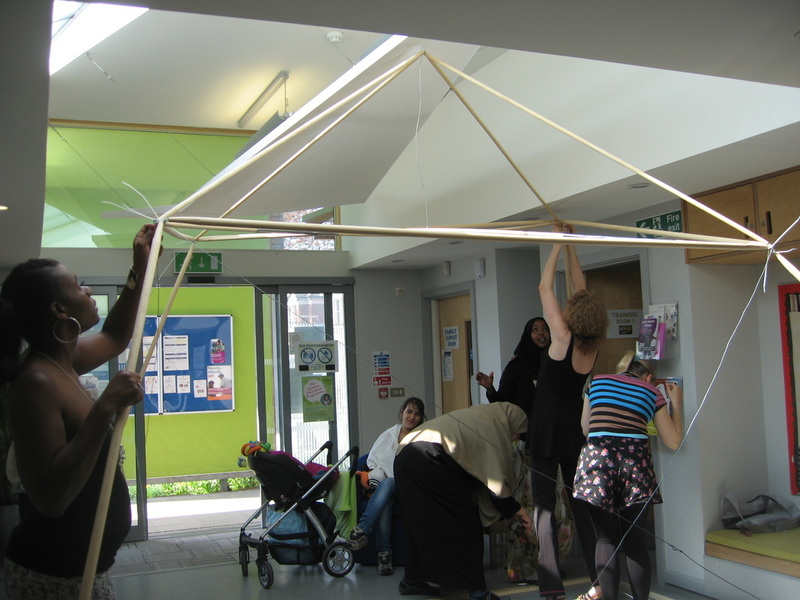 She is a skilled craftswoman and was responsible for delivering the adult education component of the project which she saw as a practical way to empower women, enable them to gain confidence, advance their education and feel part of the London community. 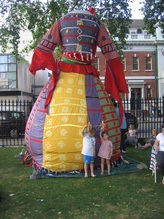 ​Streatham Women's Sewing Group CIC and I finished making this giant dress 4.5m high with an inflatable core in June. 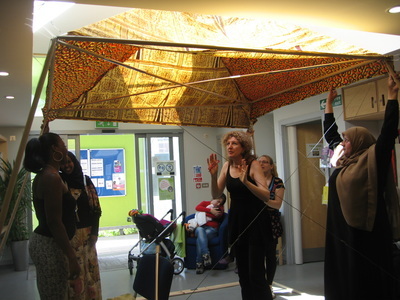 Ifrah Odawa my fellow coordinator and I installed this mega dress at four different public events & Festivals and had a wonderful response from the public. 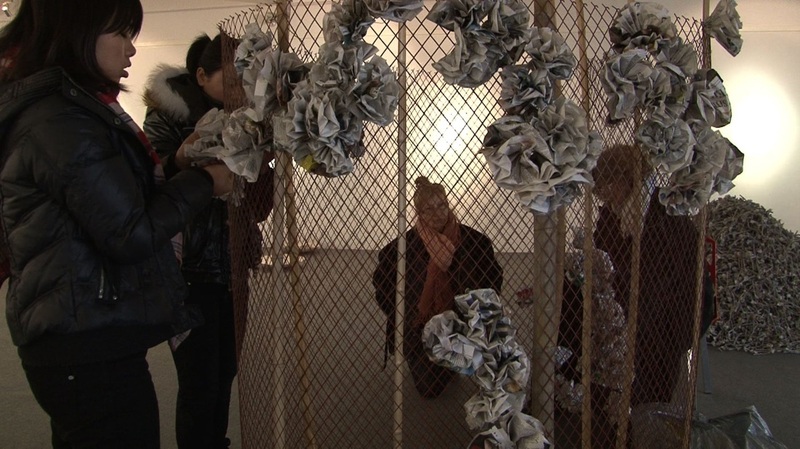 The Dress celebrated the passing of narratives, memories and skills from generation to generation of ethnically diverse women who are living in London today. 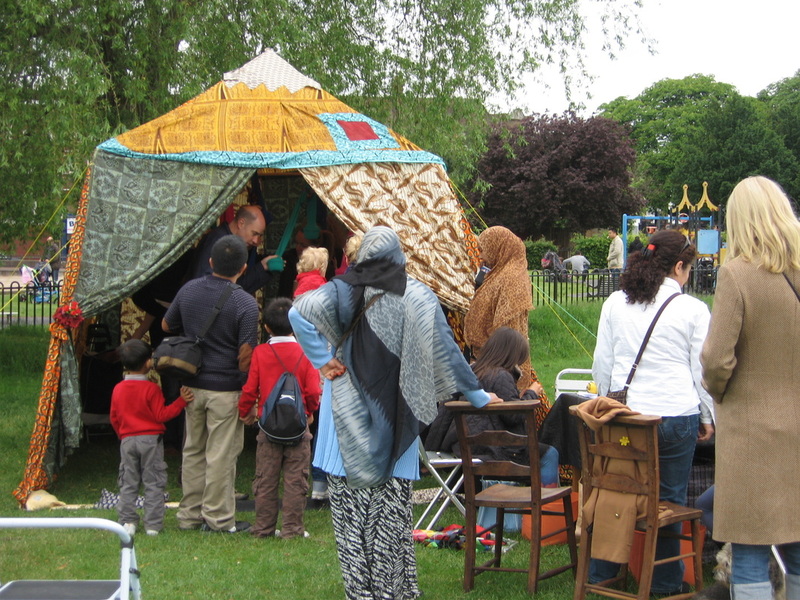 Below are images from Streatham Food Festival, and Praxis New Voices Festival at the Museum of Childhood. The project was supported by Arts Council England, Sunnyhill Children's Centre and Praxis and appeared at the Southbank Centre, Museum of Childhood, Horniman Museum, the Little Big Peace Event, Black History Month Food Festival and the Streatham Festival (Lambeth). 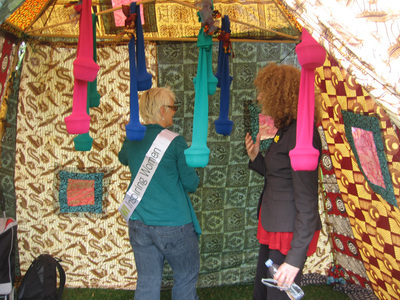 SPICE TENT was made by the women who attend Streatham Women’s Sewing Group CIC working with artist Fion Gunn and craftswoman Ifrah Odawa. 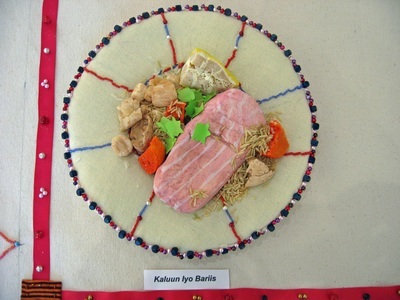 We were inspired to make Spice Tent because so many different communities in our area use spices as an integral part of their cuisine and there is always great interest in discovering new ways of experiencing taste and smell. 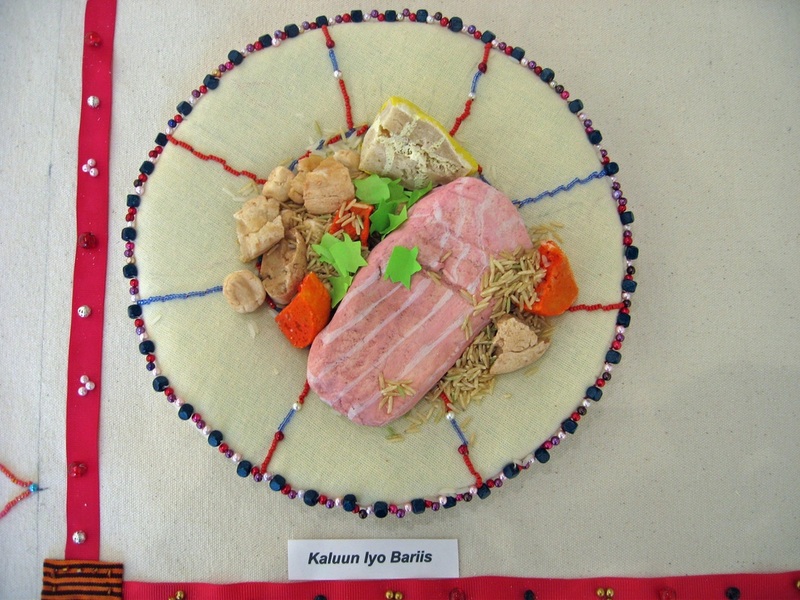 Putting the spices in pouches where they can’t be seen makes us think differently about the smells and sometimes they can be difficult to identify! For the women presenting Spice Tent and guiding the public through this olfactory experience it is an important way to encounter the wider community. 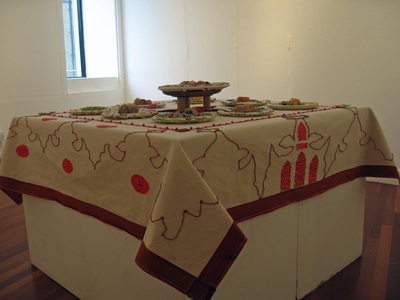 The exchange of ideas about spices, food, fabric & the arts is a conversation which we can all share and enjoy and one from which we can all learn. Our tent is made from African waxed prints bought in Brixton and our spices and fruits are bought from local shops. 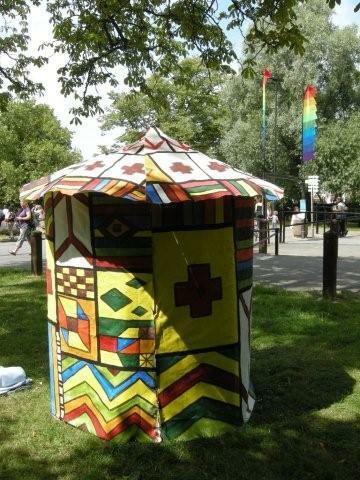 The fabrics used are familiar to and used by many different ethnic communities in Streatham and characterise the richness and diversity of area. 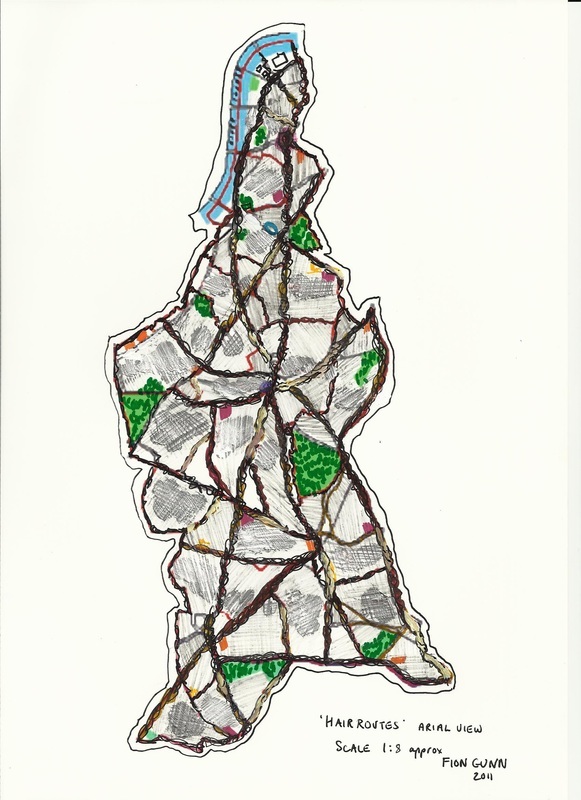 We bought an extra large map of Lambeth and transposed it onto canvas. 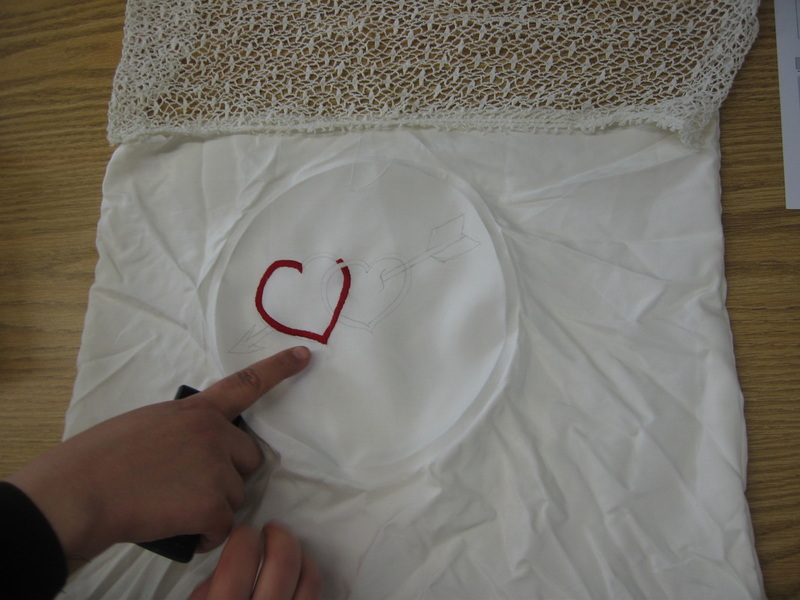 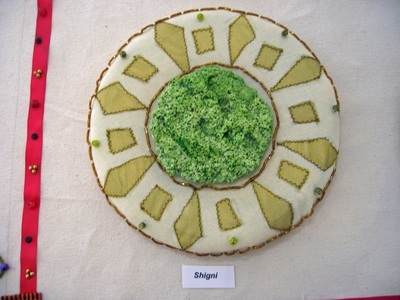 We then created the topography of the borough in sections using embroidery, appliqué and beadwork. We used different kinds of hair, bought as wigs/extensions from local shops to create the roads that run through Lambeth. The importance of hair as a cultural icon in the diverse black communities is well documented, even for those women who cover their hair, the aesthetics, the social & political complexities involved are of great relevance and interest to all African/black communities. Equally among the other Lambeth communities, white British, European and Chinese hair, its styling & treatment etc is always a priority and a ‘bad hair day’ is high on the list of annoyances. 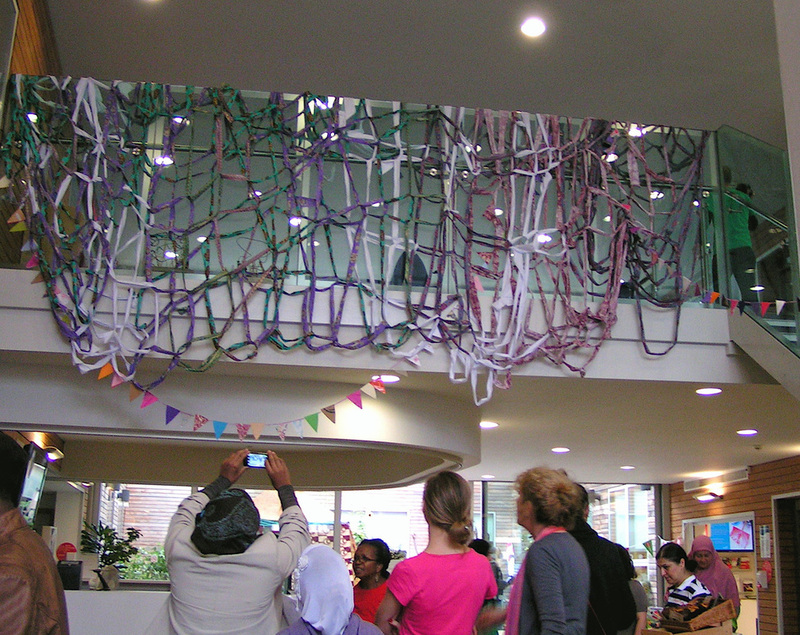 This artwork was a great way of engaging the women in the Group and the wider community in a personal, cultural and aesthetic conversation. 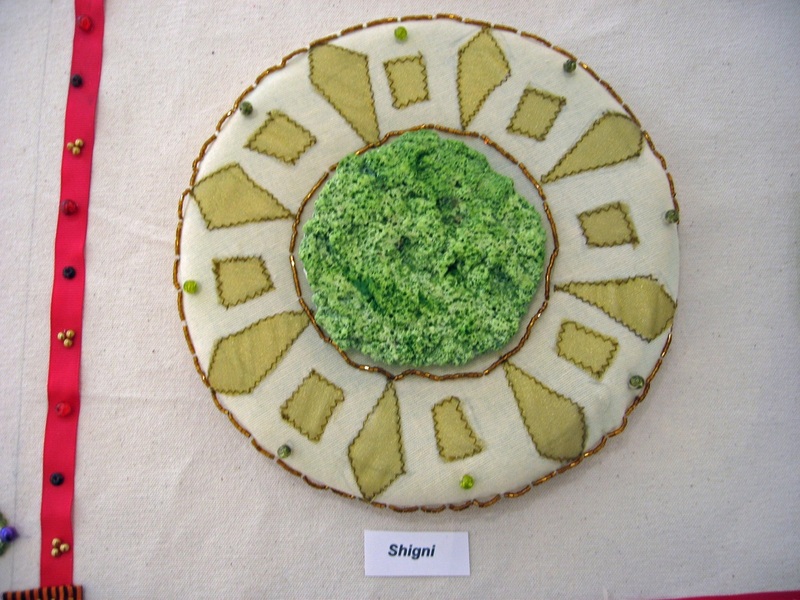 I designed a structure that replicated approximately a traditional Somali House (based on a rural Somali circular house with a conical roof). The pattern on the fabric which is stretched over the frame replicated traditional Somali beadwork patterns. The 'House' was installed on Streatham Common during the Festival, members of the public of all ages came to learn how to do the beadwork and this is where I met Ifrah and our plans to start the Streatham Women's Sewing Group began. 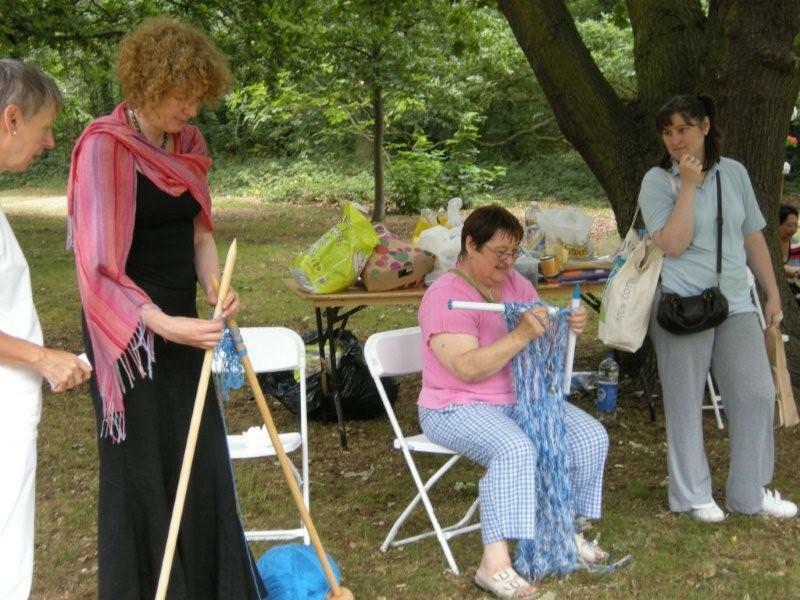 The ‘Knitting Nancy’ activity requires no skill amongst those acting as the ‘nails’ and very little skill from the two people doing the ‘threading and yet the result is quickly achieved and quite dramatic. 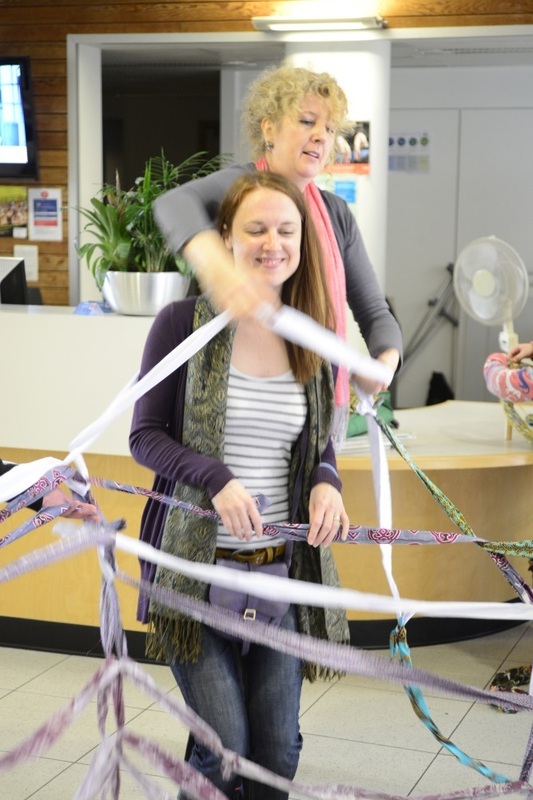 This activity allows many adults of all ages & abilities to participate and in this way gain an insight not just into how basic ‘stitches’ are formed, the process of knotting and the mathematical aspects of knitting, but also the whole social dynamic of a ‘knitting circle’. 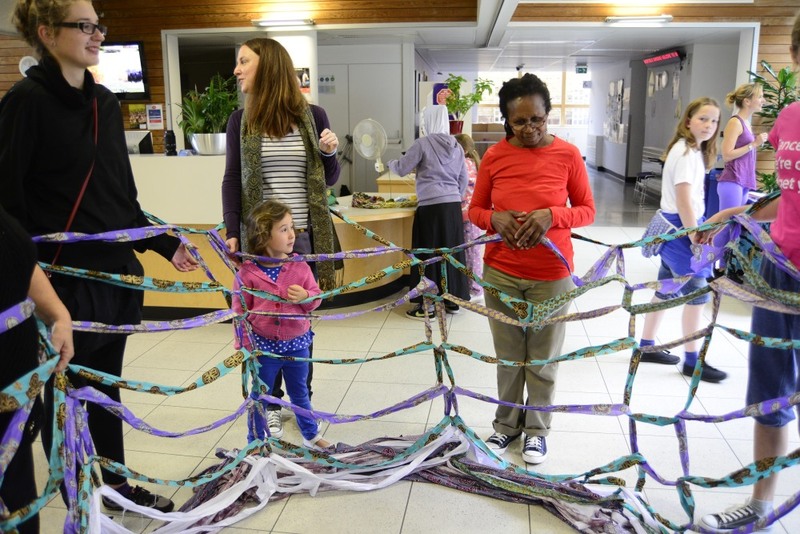 More importantly it demonstrates symbolically the interconnectedness of people & the ties which link us. ART CUBES - Art for All! 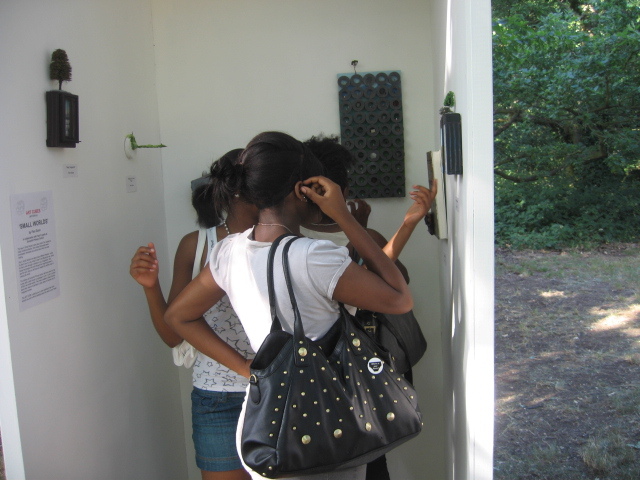 Art Cubes was a collaborative project with artists & local partners Sunnyhill School and the British Home. 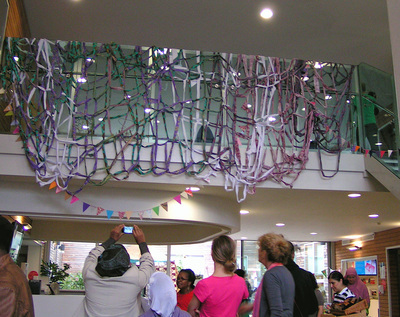 The artists' work was installed inside the cube and the local partners' outside making 2 micro exhibitions. 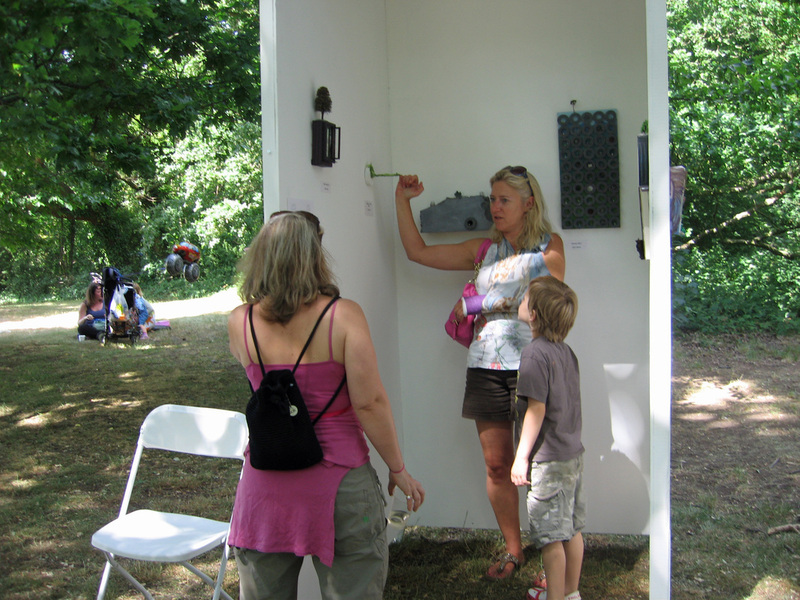 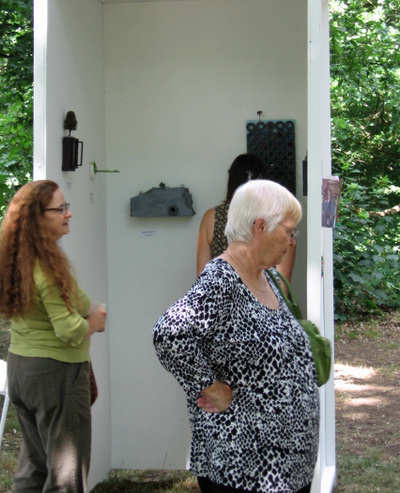 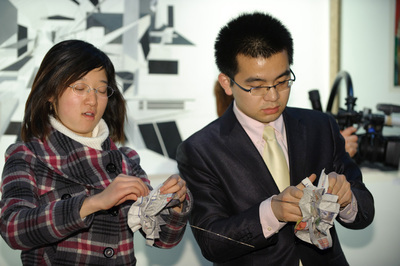 The Cubes enabled many people at the Festival to engage with contemporary art in a way they would otherwise not experience. 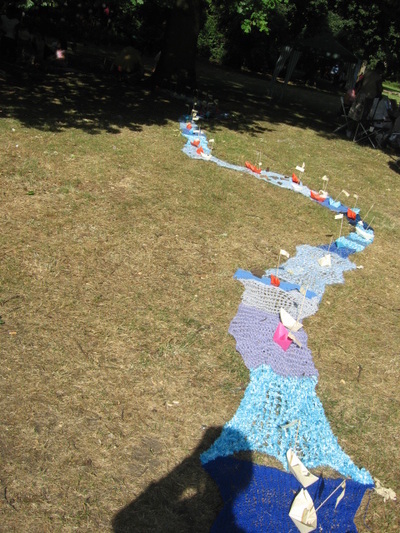 The Knitted Stream was made in collaboration with local residents over a 2 month period before the Festival and a call went out on the network inviting people to turn up on the day with pieces of knitting to contribute. 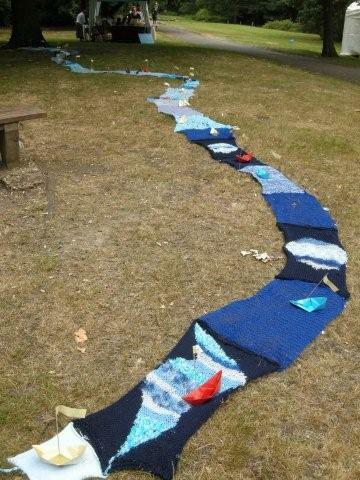 On the day of the installation we lay all the pieces on the ground to form a stream which had origami boats & ducks attached to it. 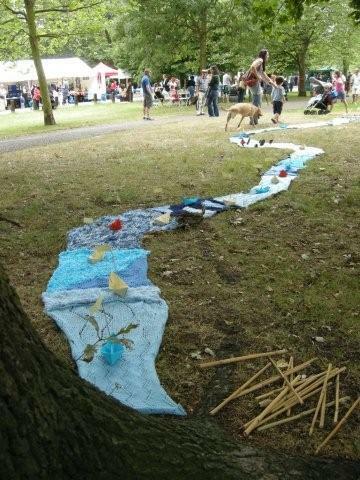 The origami boats & ducks were made at workshops held on the 'banks' of the Stream . 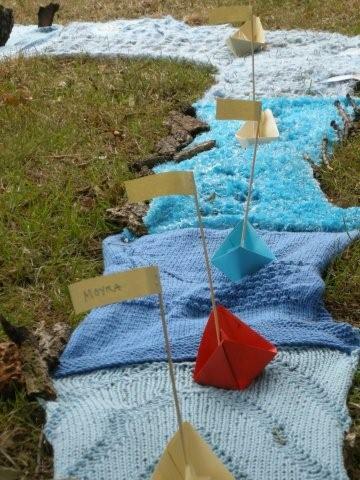 Everyone who sent a piece of knitting was credited (their names were put on flags flying from the origami boats) and received images of the installation afterwards. The public were also able to do some knitting at the event. 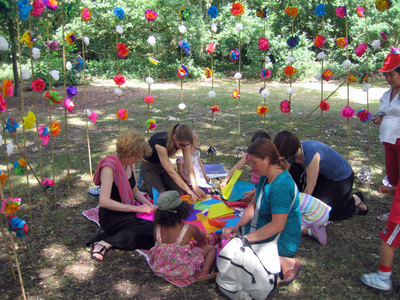 This interactive, generative installation was erected in the copse of trees at the top of Streatham Common. It was constructed from bamboo poles with polypropylene garden string woven through them and studed with paper flowers. 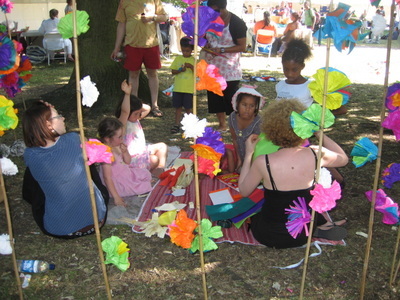 A workshop teaching children how to make the flowers was run throughout the day and their flowers were added in. 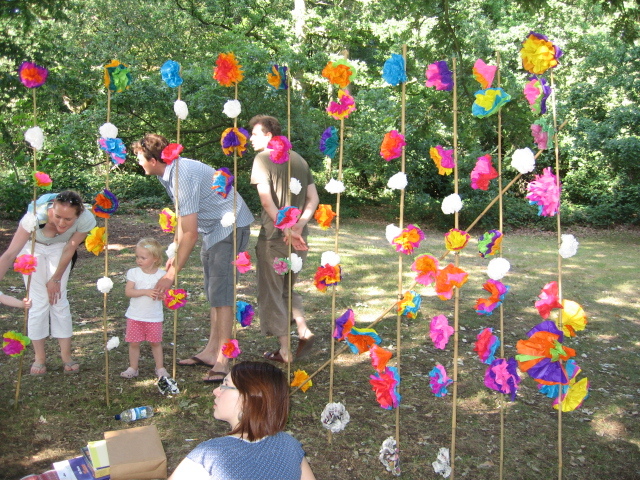 At the end of the day the children were able to take away the flowers that they had made. 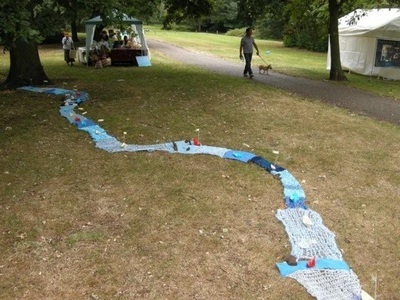 ENDORSEMENTFion Gunn participated in the Streatham Festival, of which I am Chair, for the first time this year and made a highly significant contribution with three interactive art works – ‘Knitted Stream’, ‘Flower Grotto’ and ‘Somali House of Beads’. 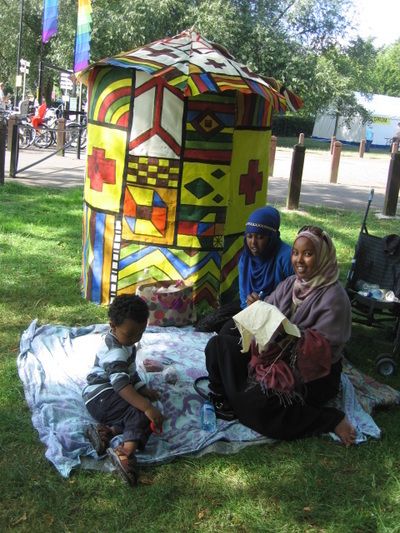 Streatham is a very mixed community with people from many ethnic backgrounds, including a sizeable community of Somalis who remain culturally isolated. 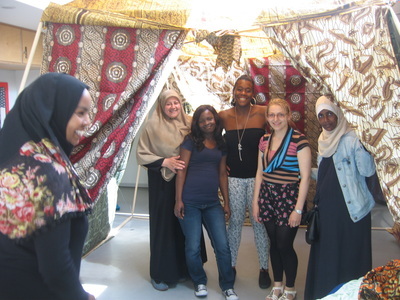 Fion worked with this community collaboratively in order to bring Somali women in particular into the Festival. 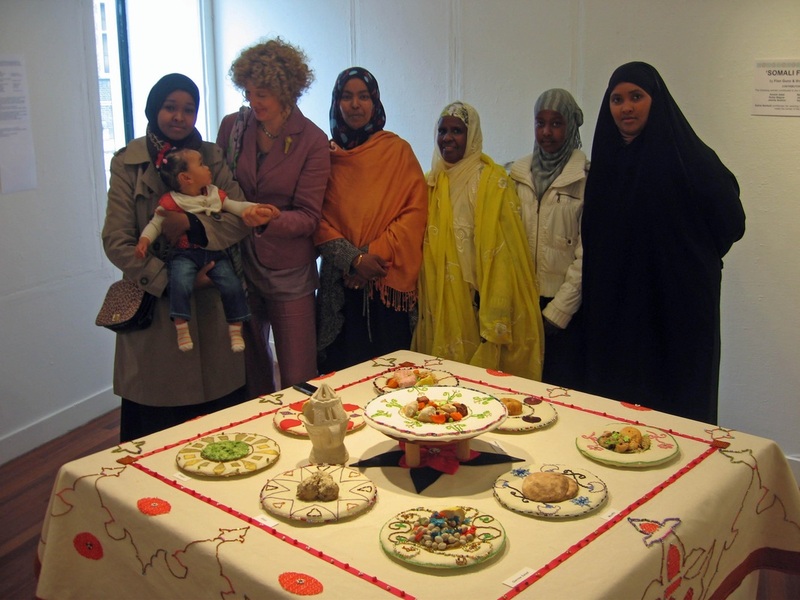 We were delighted to see that she succeeded in this and even more delighted to know that she is taking this collaboration further and is working with a number of Somali women locally on a follow up project. At the Festival. 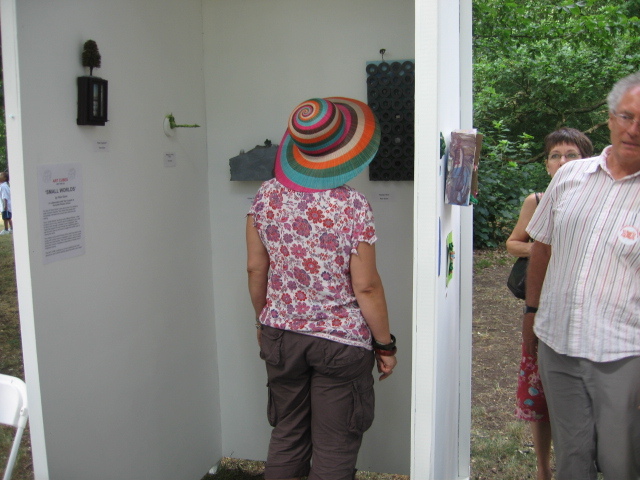 we were very impressed by the artistic quality of the art events Fion designed and we were delighted when the interest and participation from the public in them was enormous. 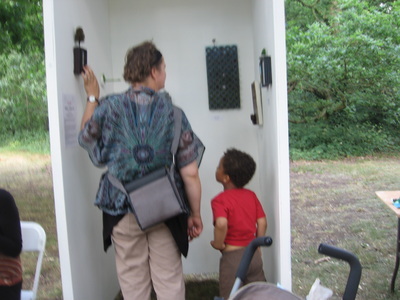 An independent evaluation of the Festival is underway at the moment and we expect to see extremely positive feedback for Fion’s projects, which appealed to all ages, abilities and backgrounds. 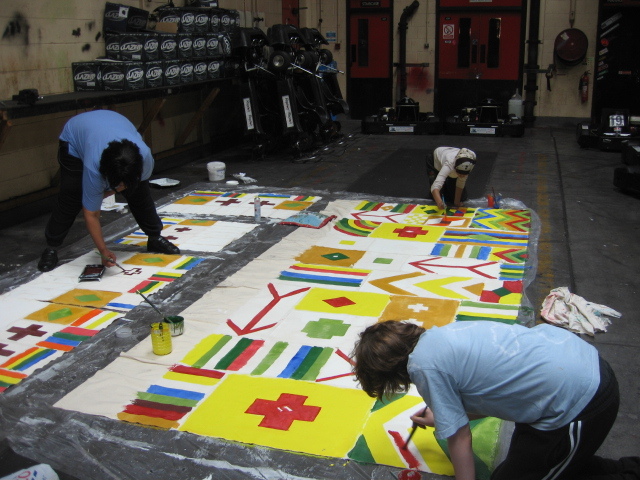 Fion was able to realise these projects in a short amount of time, while simultaneously involving and engaging with many people from diverse ethnic groups. I know that she has also had a very successful project for the Irish Travellers’ Festival in West London and has a real talent for collaboration and eliciting responses from the most reticent of groups. 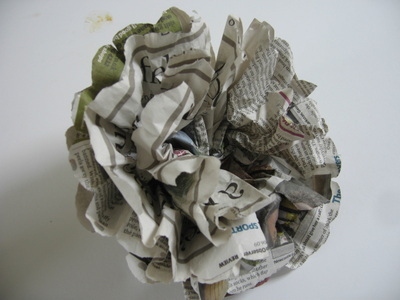 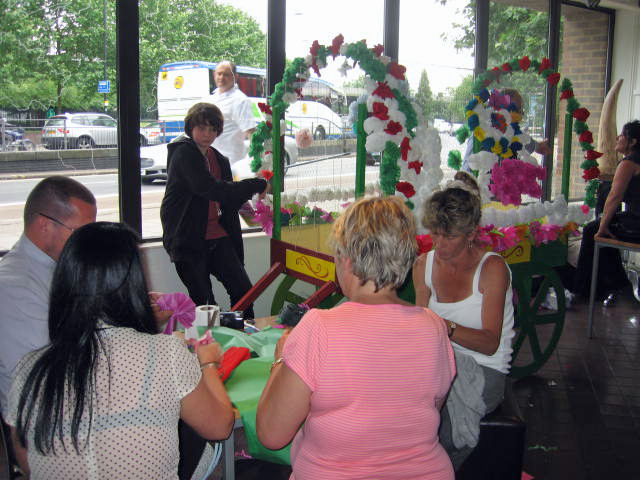 I constructed a light wooden framework for a traditional Travellers’ caravan which over the course of the 2 day Travellers' Festival was covered with paper flowers - making the flowers is a skill widespread amongst older members of the traveller community. We made many of the flowers together during these two days and later on I led workshops for the elderly at the Centre which were added to the Caraven. 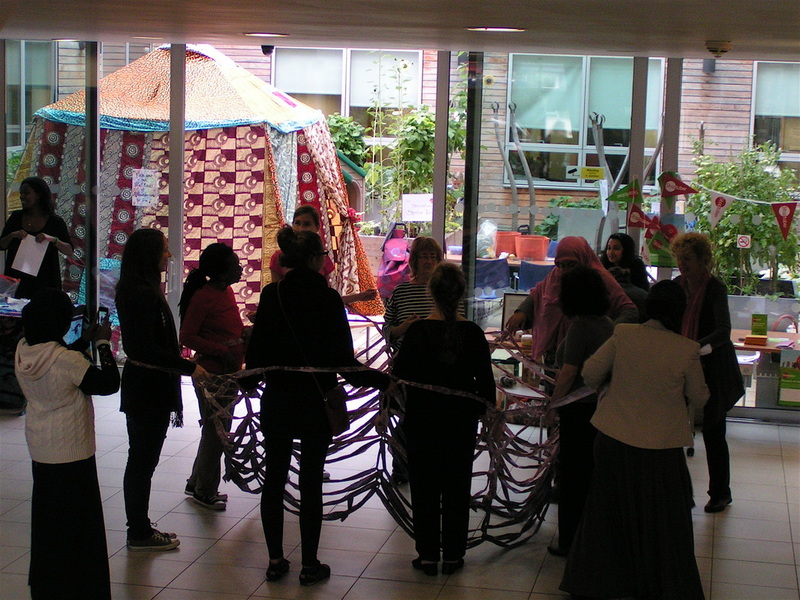 The Caravan stood in the foyer of the Irish Cultural Centre in Hammersmith for 6 months after the event. I have worked with Fion in my capacity as Capacity Development Officer at the Irish Traveller Movement in Britain in London and was struck by her ability to pull a difficult project together as well as her artistic talent. We at the Irish Traveller’ Movement in Britain were trying to stage an Art event at the Festival that fulfilled three functions: we needed to have an artwork of high quality to become a visual focal point for the event, we needed to attract the general public to the event and finally we needed to inspire interaction with the Travellers who attended the event. Fion successfully delivered an artwork that fulfilled all these criteria with the ‘Caravan of Flowers’. 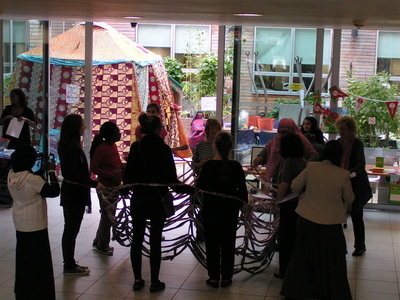 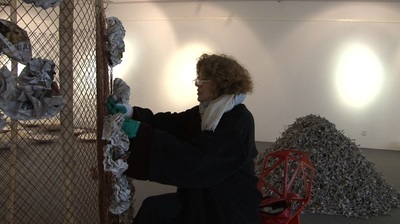 The piece was a beautiful and poignant comment on the traditions and aspirations of the Travellers, it drew on the skills of Traveller women which have been passed down the generations and drew a wonderful interactive response from the Travellers’ themselves and this is in itself an unusual phenomenon. The interactive element succeeded because Fion pitched the level of interaction correctly, all ages and abilities were able to contribute and her interpersonal skills were excellent. 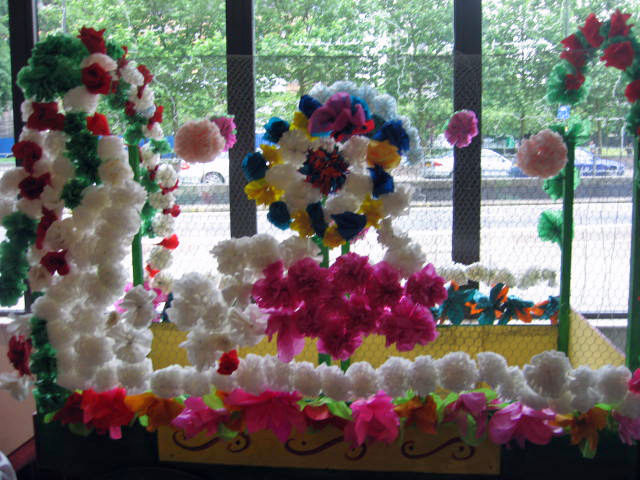 The Irish Cultural Centre where the ‘Caravan of Flowers’ is sited has had a wonderful response to the piece and although it was originally planned as a once-off event the Centre has decided to keep the artwork on a permanent basis. 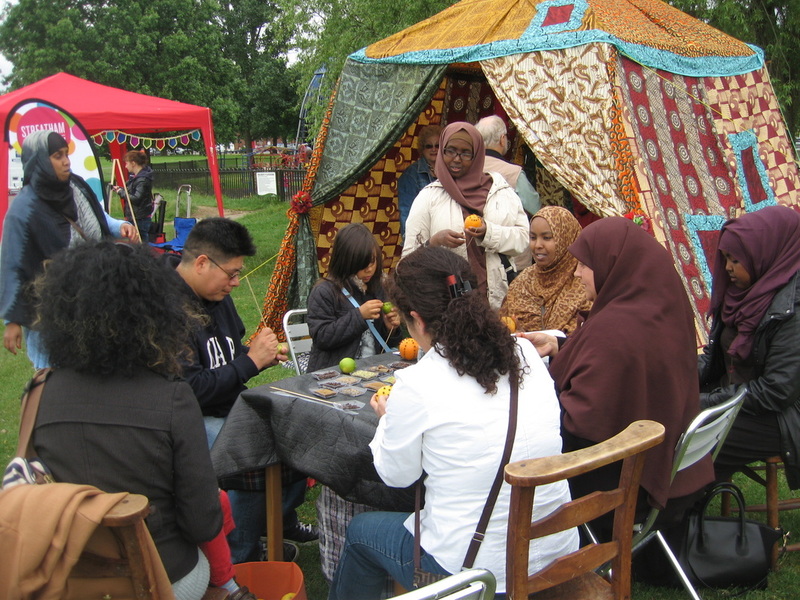 This enables the wider London community to have access to it and it also boosts the profile of the Traveller Community in a positive way. Fion is aware of the complexity of intercultural collaborations, communicates her ideas in a sensitive and inclusive way, and is ideally placed to bring her ideas to fruition. She was able to involve a young Traveller craftswoman in the project and as a result of this successful collaboration they are now embarking on a much bigger UK wide project called the ‘Travelling Quilt’ for which they have already received support from a number of local Councils. 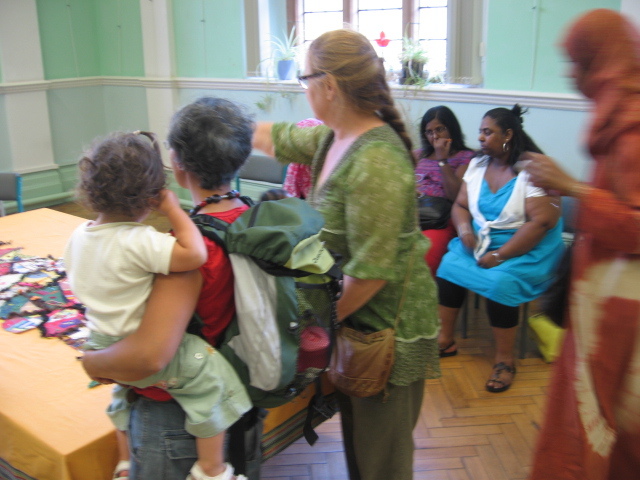 The Traveller Movement in Britain is a grassroots organisation and I was delighted to observe that Fion was able to work at this level as well as at an institutional and administrative level. She was professional and efficient in providing the artwork and she inspired the Travellers who met her and collaborated with her and her imaginative and informal approach was strikingly successful. 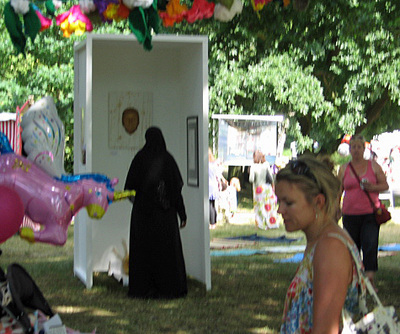 We will support her future projects with the Traveller community and we wish her every success.